Hi everyone! I felt like having a little fun today ... and leopard is always my idea of fun! I started off with two coats of Sally Hansen Wet Cement, a light grey creme. 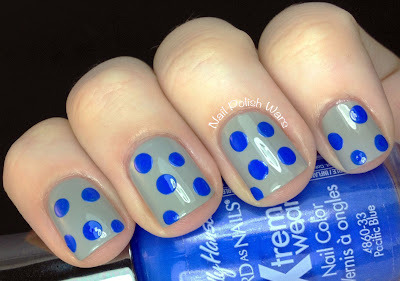 I then created randomly placed dots using my large dotting tool with Sally Hansen Pacific Blue, a medium blue creme. Next, using my small dotting tool with Wet n' Wild Ebony Hates Chris, I created the outside rosette patterns. I finished with one coat of SV. I am really happy with the final result! It's bold but muted at the same time, which is something I absolutely adore! And thank you so much to everyone for requesting I do some designs on the new nubbins!! I hope you all enjoyed it as much as I enjoyed creating it! Very cute! I love how the blue stands out against the grey! Very pretty :) I like that blue polish. 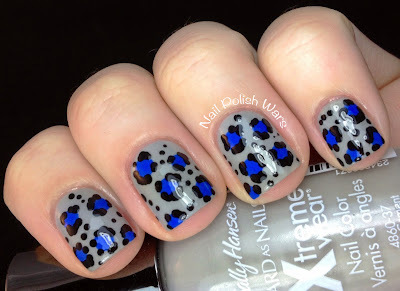 can never go wrong with leopard! You'll probably hate me saying this but I love your short nails. As I can't grow mine long can we see more shortie nail art please and Merry Christmas! Love it!! Those colors look great together!! And your short nails look fabulous!! Fun and funky, I love it. I also have to make sure you know that your nails look amazing this length. I love it! I love this! Leopard is just the best! Lovely. I love the colour combo! Lovely.. I really love how you create graphics over your nails. Its artistic.